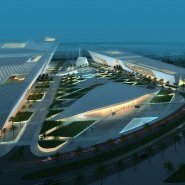 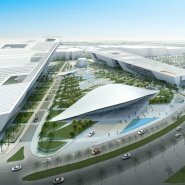 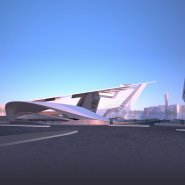 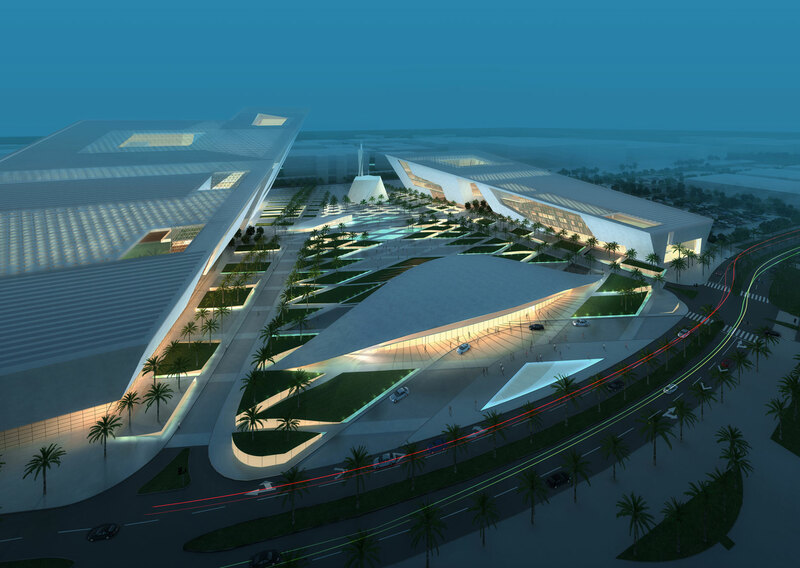 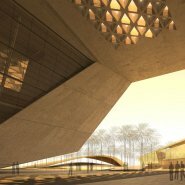 This dramatic, top-rated competition entry for Kuwait University’s central administrative facilities complex, a subdistrict of the main campus, includes an administration building, a conference center, a convocation hall, a cultural center, a library, a visitor center and a grand mosque. Our scheme is an integrated complex of buildings that promotes accessibility, creates a strong dialogue between the buildings and the landscape, allows for unparalleled views of the campus and takes full advantage of the benefits of light and shade. 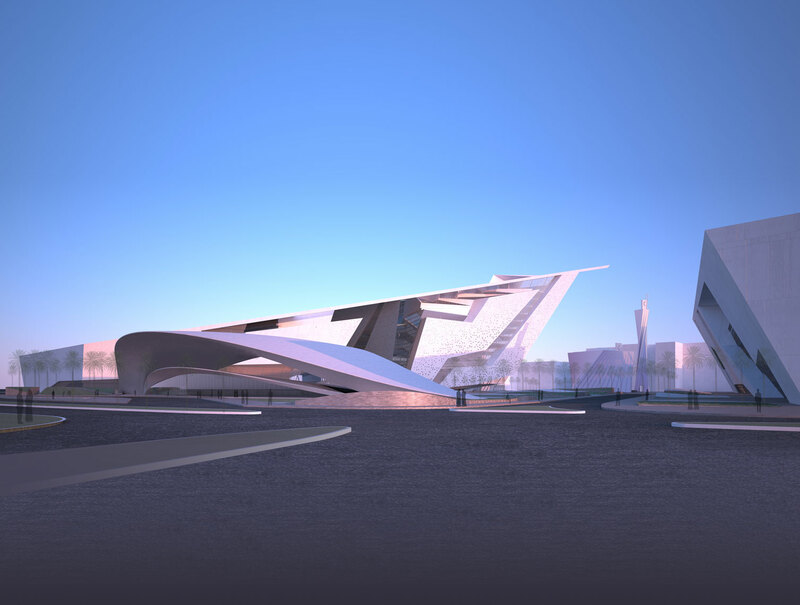 On the eastern side of the campus, the adjacent central administration building and cultural center share a sloped roof plane, unifying the two buildings into a single volume. 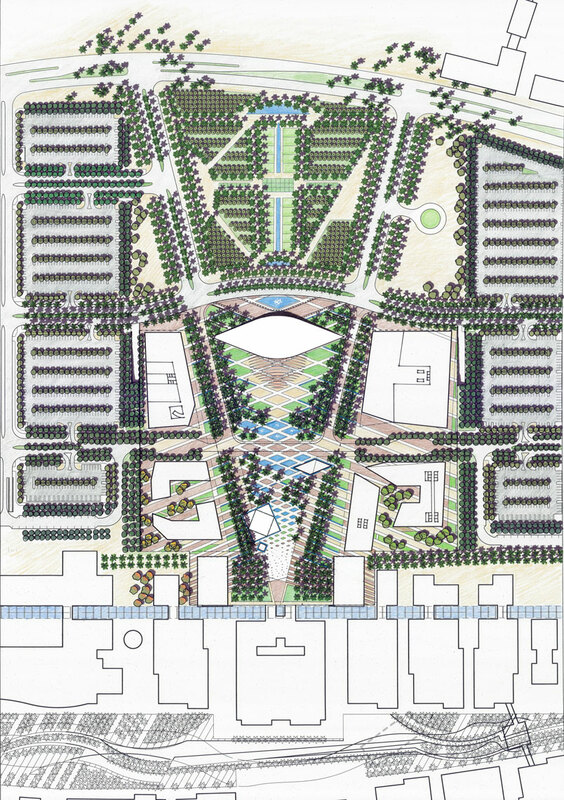 On the western side, the adjacent conference center and library mirror this form, creating a dialogue between the main campus buildings. 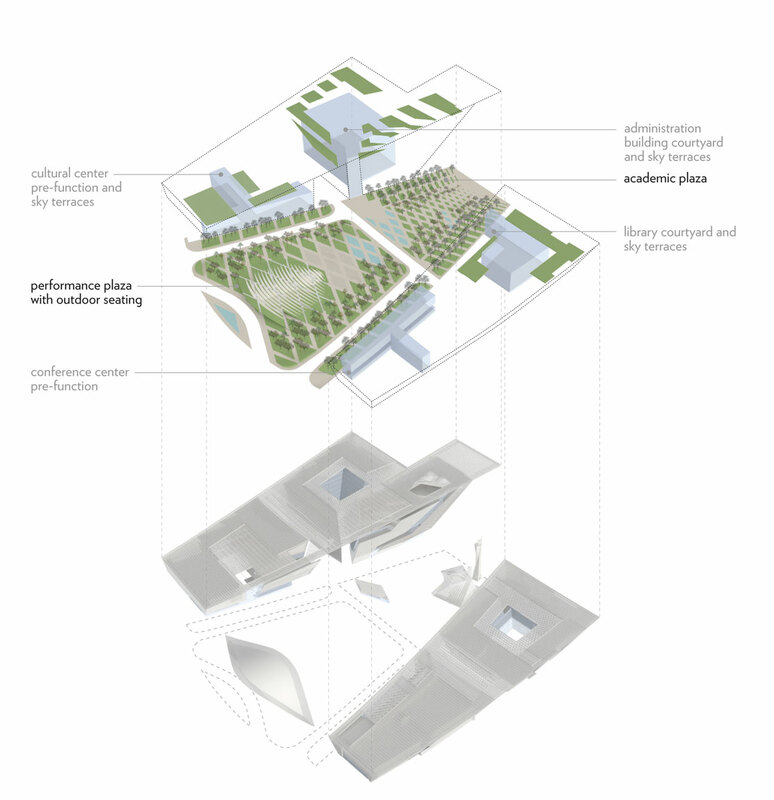 The campus recalls traditional regional design in a number of contemporary ways. 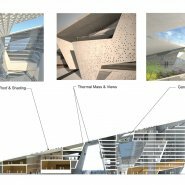 We explore the duality of light and shade, a central design theme in the desert landscape, by creating courtyards and shaded spaces, indoors and outdoors. 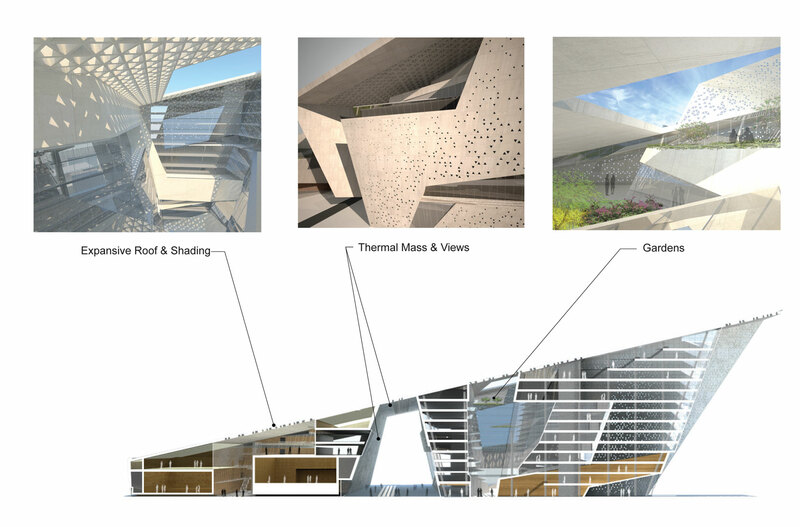 Islamic-inspired geometric patterns are incorporated throughout, in courtyard trellises and building facades, resulting in dappled light patterns and shadows. 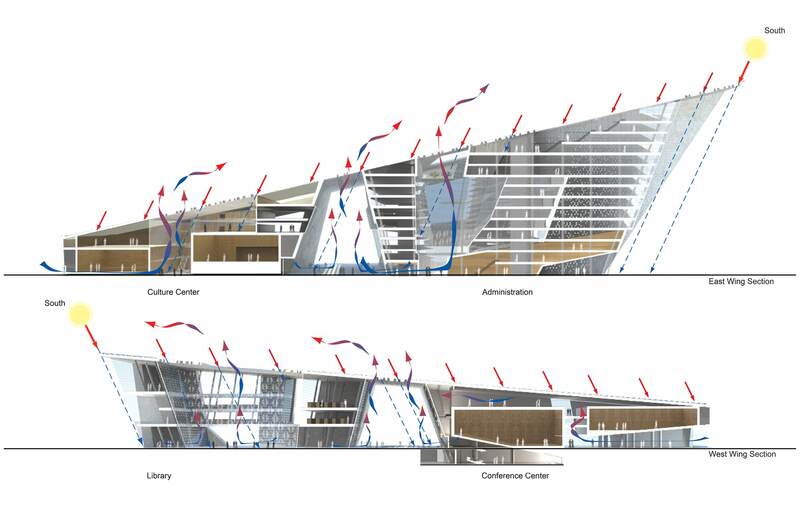 The scheme’s energy performance represents a modern vision of proven vernacular responses to an intense climate. 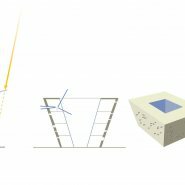 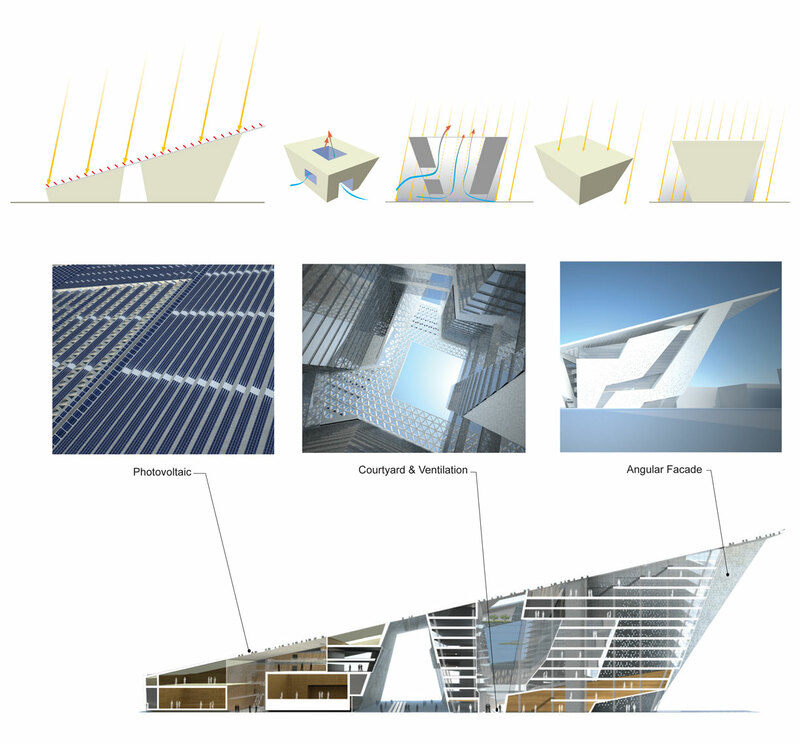 The building guards itself and the lower public realm from intense high-angled sun through responsive angled facades, reducing solar gains by over 20% in concert with an expansive roof system, which, by being permeable, allows for controlled daylight penetration and ventilation. 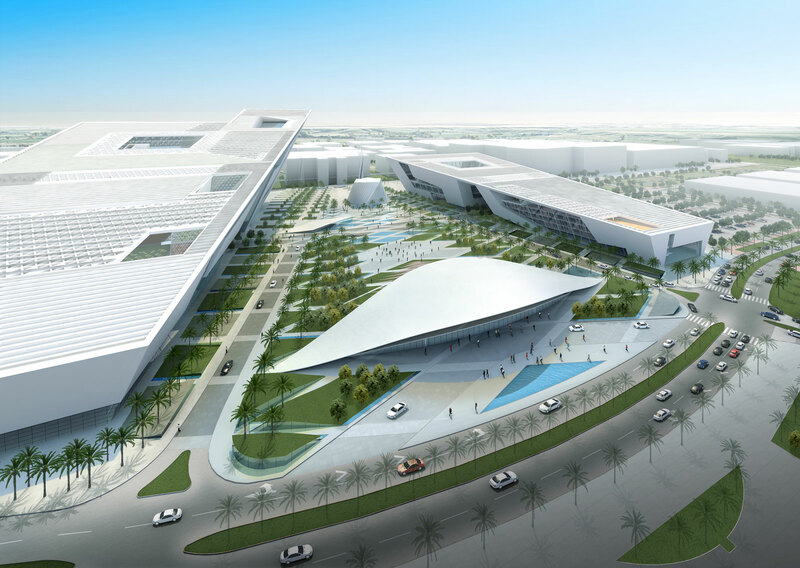 To further take advantage of the climate, solar energy is harnessed through a 19,000 sm building-integrated photovoltaic system, which will generate approximately 4,560 MWh of electricity. 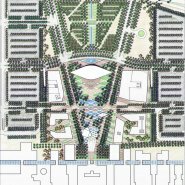 The building also makes use of regional planning principles by means of an inward-focused design incorporating landscaped courtyards. 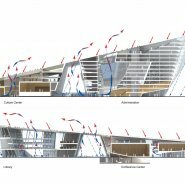 Through shading and integral landscaping, temperatures are moderated throughout the day, allowing cooler air to sink into the courtyard at night, which is then stored by the monolithic thermal mass walls, allowing a further reduction in temperature throughout the following day. 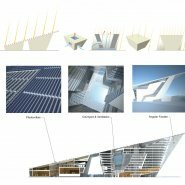 These passive strategies are coupled with intelligent dynamic control of an energy management system, including occupancy and carbon dioxide sensors; energy recovery via total enthalpy wheels and desiccant dehumidification systems; daylight dimming ballasts; and variable-speed, electrically commutated smart motors on fan coil units that will prevent excessive fan energy while improving thermal comfort and acoustics.